Phleum intermedium Jord., Phleum parnassicum Boiss. 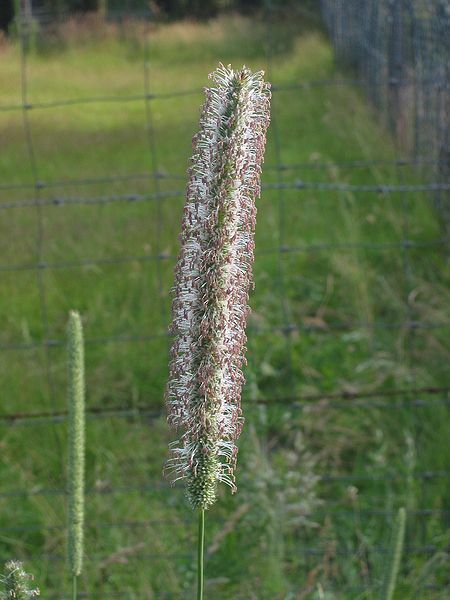 Timothy grass (Phleum pratense) is a cool-season perennial grass from temperate regions. It grows in erect culms 50 cm to 1 m tall (sometimes up to 1.3 m) (AWI et al., 2012; FAO, 2013). It has a shallow, fibrous root system (AWI et al., 2012). Its lower internodes remain short and become enlarged, forming a bulb (haplocorm, corm, bulblet) that serves as a storage organ for carbohydrate reserves. Individual shoots live during parts of two growing seasons, and some new shoots develop each year from older ones, which results in a perennial stand (Lacefield et al., 1980). The leaves are smooth and hairless, pale green to greyish-green. They are rolled when young and become flat and pointed, slightly rough on the margin, rather large (3-10 mm) and long (up 30-45 cm) (FAO, 2013; AWI et al., 2012). The seed heads are dense cylindrical spikes up to 15 cm in length. The seeds are very small, with approximately 3 million seeds per kg (AWI et al., 2012). A characteristic of timothy grass is its fast growth relative to other grasses, which enables it to accumulate quite a lot of standing biomass before senescence appears (FAO, 2013). However, this fast maturity means that the harvest window for optimal quality is narrower than for other grasses (Bernes et al., 2008). Timothy grass is one of the most popular cool-season perennial grasses in some regions, such as North-Eastern and North-Western USA, Eastern Canada and Nordic countries (Cherney et al., 2011; Bernes et al., 2008; Bélanger et al., 2001). Timothy is highly palatable to livestock and produces high quality forage for hay and grazing, depending on the area. It is used in cool humid, temperate and high rainfall regions for grazing, primarily by cattle (AWI et al., 2012). Timothy is often seeded in mixtures with legumes such as alfalfa or clover for better performance, but it is also grown in pure stands to make premium hay, notably for horses (Bush, 2002; Esser, 1993). Phleum pratense is the sole cultivated Phleum species although the small timothy (Phleum nodosum L.) is cultivated in some countries (Larsen et al., 2006). Commercial cultivars with improved agronomic properties such as pest resistance and winter hardiness are available. Timothy grass is native to Europe, temperate Asia and North Africa, and has become naturalized in many cool or temperate regions including Russia and Japan (Lacefield et al., 1980; Bélanger et al., 2001). It is grown in Australia and New Zealand (AWI et al., 2012; Charlton et al., 2000). It was first valued as pasture grass in the USA, where it was widely promoted from 1720 onwards, initially by a farmer named Timothy Hanson, hence its common name. From North America the cultivation of timothy grass spread to England in the 1760s and from England to the other European countries (Larsen et al., 2006). Timothy has a large climatic range. It is well adapted to humid, cold and cool climates. Its good tolerance to cold makes it a very useful forage plant in mountain areas and northern countries (FAO, 2013). Timothy grass does not tolerate drought and periods of prolonged high temperatures above 25ºC. Optimum temperatures for growing are 18-22ºC with night temperatures above 10ºC. It is best suited to areas receiving more than 900 mm average annual rainfall, with a reliable summer rainfall (AWI et al., 2012). It makes a poor recovery under limited moisture conditions. Timothy grows best on rich, moist bottomlands and on finer textured soils, such as clay loams. It does not do well on coarser soils. 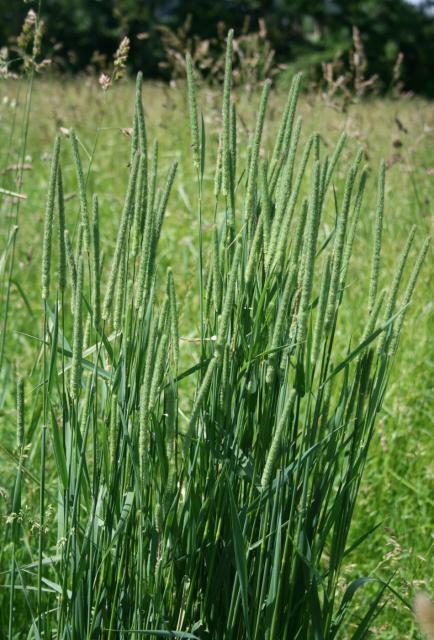 Timothy grass will grow for a time on low-fertility soils, but it is better adapted to a high-fertility soil (Bush, 2002). Timothy prefers a pH between 5.5 and 7.0. It is not tolerant of high soil aluminium levels (AWI et al., 2012). It is not well adapted to wet, flat land where water stands for any considerable time, though it can withstand somewhat poorly-drained soils (Bush, 2002). Timothy thrives in partial shade and can even survive heavy shade. In shaded conditions, however, its carbohydrate reserves are lower and flowering can be delayed or suppressed (Charlton et al., 2000). Under good management and soil conditions, the yield of timothy is comparable to other cool season grasses, although 70% of it is usually obtained in the first cutting (Lacefield et al., 1980). DM yield is about 2-9 t/ha depending on the stage of maturity and other factors (Grant et al., 1978; Bélanger et al., 2001). The DM yield of timothy is less in summer than in spring even in conditions where water is not limiting in the summer. Because DM yield increases with maturity whereas nutritive value declines, choosing a harvest date requires a compromise between the choice of increasing nutritive value at the expense of DM yield or vice versa (Bélanger et al., 2001). In pure stands, the first crop is usually harvested for hay or silage. For highest quality hay, timothy should be harvested in spring during late boot to early flowering stage, as digestibility decreases beyond this stage. Aftermath growth can be grazed at four- to six-week intervals (Lacefield et al., 1980). Timothy is especially sensitive to overgrazing because only a small part of its total leaf area is below the close-grazing height. Continuous close grazing and trampling injures the bulbs, preventing the storage of food reserves, which results in lower yield and shortens the life of the plant (Lacefield et al., 1980; Bush, 2002). Grazing management should be lax, leaving a residual of 30-50 mm. New tiller production is dependent on the reserve of carbohydrates stored in the bulbs. In order to build up these reserves, timothy grass should be grazed infrequently during late spring/early summer (Lacefield et al., 1980). Typical companion grasses include temperate grasses which have comparable seedling vigour such as cocksfoot (Dactylis glomerata) and tall fescue (Festuca arundinacea). Timothy is not compatible with the more aggressive temperate grasses such as perennial ryegrass (Lolium perenne) or pasture brome (Bromus sp.) grasses (AWI et al., 2012). In Nordic countries, timothy grass is commonly used in mixtures with meadow fescue (Festuca pratensis), another winter hardy grass (Virkajärvi, 2006). Timothy is one of the most legume-friendly grasses due to its non-competitive nature. Many temperate legumes including alfalfa, red clover (Trifolium pratense), white clover (Trifolium repens), strawberry clover (Trifolium fragiferum), Talish clover (Trifolium tumens) and birdsfoot trefoil (Lotus corniculatus) are potential companion legumes (AWI et al., 2012). In subsequent cuts of a timothy-grass mixture, the legume will predominate (Lacefield et al., 1980). Timothy grass has a low weed potential (AWI et al., 2012). Timothy grass provides important cover for a variety of game birds, small mammals and waterfowl (Esser, 1993). Timothy grass helps stabilize the soil and has been used in erosion control. It is well adapted to intense disturbances and is widely used for rehabilitation of highly disturbed sites: cut-over, burned-over and overgrazed mountain rangelands, sites disturbed by the construction of railroads, canals, trails or highways, logged sites and strip mines as well as sites altered for recreational purposes (Esser, 1993). Timothy is a very palatable grass and is usually ranked higher in energy than cocksfoot or tall fescue at comparable stages of maturity (Lacefield et al., 1980). It is considered as an intermediate crop for livestock, as it contains less protein than alfalfa but more than fodder maize (Grant et al., 1978). However, in contrast to other grasses, its quality (digestibility, protein content and palatability) declines rapidly as the plant matures, especially during primary growth. The following table shows the variation in crude protein, NDF and ADF content in France and Sweden. The content of water-soluble carbohydrates in timothy grass is relatively high when the plant is young and drops quickly during maturation. In a trial in Finland, the water-soluble carbohydrate content of fresh timothy grass was higher than 30% DM in early spring (vs. 18% for tall fescue and 23% for meadow fescue), down to 15% in late spring and lower than 10% DM in late summer (Särkijärvi et al., 2010). Due to this fast maturing, and to the short spring and intensive growing season in northern latitudes, the timing of harvest has a major impact on the nutritive value (Bernes et al., 2008). The decrease in protein content and DM digestibility, and the increase in ADF and NDF concentrations with increasing DM yield or maturity during a growth cycle have been reported in many studies. Similar patterns have been observed under varying levels of N application and also for early- and late-maturing timothy cultivars. Rates of the decline in digestibility reported in the literature vary widely, from 0.2 to 0.7 percentage units per day (Bélanger et al., 2001). This decline can also be observed with changes in climatic and environmental conditions. In Canada, a decrease of 3.2 percentage units per °C and per day was found for in vitro digestibility as well as an increase of 0.47 g/kg DM of NDF per °C and per day. Hence, delaying harvest by one week with an average daily temperature of 15°C will result in a decrease in in vitro digestibility of 3.4 percentage units, and in an increase in NDF concentration of 4.9% DM (Bélanger et al., 1996). In Sweden, values of -3.0 and -3.6 percentage units per °C and per day have been reported for DM digestibility (Thorvaldsson, 1987; Thorvaldsson et al., 1988). In addition to feed for cattle and sheep, timothy hay is widely used for horses and is a desirable grass as a component of horse pasture (Lacefield et al., 1980). Timothy is free from any toxic substances (AWI et al., 2012). When fed at the same digestibility level, perennial ryegrass was superior to timothy, because of a 5-15% higher voluntary feed intake (Minson et al., 1964; Miles et al., 1969; Charlton et al., 2000). This was related to a slower rate of passage and a longer retention time in the gut, an effect attributed to higher lignin content, and to the proportion and composition of the digestible fibre of timothy. Animal performance may be further limited in some situations by its low sodium levels (Charlton et al., 2000). In a comparison between conservation methods of timothy for dairy cows, haying reduced feed protein degradation in the rumen compared to ensiling though protein metabolism was unaffected by treatments (Martineau et al., 2007). Timothy hay, silage and pasture are valuable forages for dairy cows. In Canada, in diets containing 17 or 34% barley (DM basis), early cut timothy silage fed to mid-lactation cows was found to have a comparable nutritive value to that of alfalfa silage, when stored at a similar ADF content (Orozco-Hernandez et al., 1997). In Japan, cows fed timothy hay (harvested at different stages) with 4.9 g/d of concentrate produced 17.8 (early stage) to 14.6 kg/d (late stage) of milk. Milk protein and milk sugar were also higher for the early cut timothy, which was explained by the higher intake of digestible carbohydrates in the younger hay (Nishino et al., 2004). In a three-year experiment, early lactation dairy cows fed cut-and-carry fresh timothy grass supplemented with 9.5-10.5 kg/d of concentrate had an average DM intake of 13 kg/d of grass, and an average milk yield of 39.7 kg/d. It was concluded that timothy pasture with suitable supplementation could support the requirements of high-yielding cows without impairing their reproductive and health status (Ohgi et al., 2006). In areas where timothy is a better quality forage than other local grasses, it can play an important part in dairy diets. In Iceland, for instance, since the mid-1990s silage of first cut timothy, harvested before mid-heading and fed with barley grain, has been the basic high quality winter feed for high producing dairy cows (Sveinsson et al., 2006; Helgadóttir et al., 2006). Later cutting dates for primary growth in timothy are not acceptable for high lactating cows and fast growing ruminants (Sveinsson et al., 2006). However, it has been noted that the relatively low protein content of timothy requires supplementation and its use may not be economically justified if supplementary sources of protein must be purchased (Cherney et al., 2011). Timothy can be valuable for dry cows due to its lower dietary cation-anion difference (DCAD) than other cool-season grass species. The DCAD can be decreased even more by fertilizing timothy with CaCl2 or NH4CI or, in a more effective and economic way, by growing timothy on low-K soils. Feeding timothy hay with a low DCAD may help reduce the incidence and the extent of milk fever in dry dairy cows, thus increasing milk production and lowering production costs (Charbonneau et al., 2008). Timothy can be used for growing cattle. In a three-year experiment in Canada, Hereford steers grazing timothy had a higher average daily gain (1.13 vs. 0.79 kg/d) than animals grazing meadow foxtail (Alopecurus pratensis). Animal productivity of timothy was lower in spring but was sustained over the full grazing season (Rode et al., 1986). In a two-year experiment in Japan, Aberdeen Angus steers grazing intensively timothy pastures had average daily gains of 0.7-0.75 kg/d (Ikeda et al., 1999). In a follow-up experiment, supplementation with timothy silage (3.6 kg DM/d) resulted in higher daily gains (0.81 vs. 0.65 kg/d) (Ikeda et al., 2000). In grazing lambs and ewes in Wales, a three-year comparison study between timothy, tall fescue, cocksfoot and perennial ryegrass resulted in significantly higher average daily gains from timothy-fed lambs (194 g/d vs. 170 g/d for fescue and ryegrass and 159 g/d for cocksfoot). Timothy-fed ewes had a slightly positive weight gain on average, which was lower than with ryegrass but higher than with fescue or cocksfoot (Davies et al., 1982). In Sweden, in lambs fed timothy silage from grass harvested at different stages of maturity there was a reduction in voluntary intake and lamb performance when maturity increased. DM intake decreased from 30 g/kg LW (harvested before heading) to 20.5 g/kg LW (harvested when 50% of the plants had panicles longer than 5 cm). Likewise, daily gain decreased from 152 to 76 g/d. This decrease in forage quality was linked to changes in chemical composition (NDF increased from 51 to 61.5% DM) and in the in vitro degradation characteristics of the silages. It was, therefore, recommended to harvest timothy before heading (Bernes et al., 2008). Timothy hay has long been recommended to provide fibre, in addition to concentrate feeds, in rabbit diets for smallholder rabbit meat production (Cassady et al., 1966; Schlolaut et al., 1995), and more recently for pet rabbit maintenance (McNitt et al., 2013). Contrary to alfalfa hay, timothy hay cannot support maintenance in adults when used as the sole feed (Richards et al., 1962; Uden et al., 1982). However, it has been possible to include timothy hay up to 60 or even 75% in balanced diets without causing health problems (Keener et al., 1958; Uden et al., 1982). The nutritional value of timothy hay for rabbits is not very high. Estimations of the digestible energy content range from 5.8 to 6.2 MJ/kg. Protein digestibility is low: 62% for early cut young timothy grass (crude protein 17% DM) and 42-47% for mature hays (crude protein less than 6% DM) (Voris et al., 1940; Richards et al., 1962). In addition, it must be pointed out that as for most Poaceae the lysine content of timothy protein is very low and covers only 70% of the lysine requirements of growing rabbits. The very low calcium content of timothy hay (0.33% on average) can be advantageous or unfavourable, depending on the calcium content of the other diet ingredients. Timothy hay, either alone or in mixtures with alfalfa, is very popular as a forage for horses, notably in the United States (Ordakowski-Burk et al., 2006; Hoffman et al., 2009). It is highly suitable for animals kept for recreational use that do not require high performance diets, less so for more demanding animals such as brood mares, working horses and foals (Cherney et al., 2011). In a comparison between timothy hays harvested at different stages, OM digestibility was much higher for late vegetative hay than for late bloom hay (50-51 vs. 36-37%). At both stages, chopped and ground hays had a similar digestibility and resulted in similar retention times (Miyaji et al., 2011). When compared to reed canary grass hay, timothy hay was more palatable (DMI 1.8 vs. 1.5% LW) and apparent DM digestibility was higher (56 vs. 46%) (Ordakowski-Burk et al., 2006). Due to a lower N excretion, feeding timothy hay supplemented with oats to horses at maintenance, or under light to moderate exercise, was found more environmentally sustainable than feeding alfalfa (Woodward et al., 2011). Timothy haylage is popular in some European countries for feeding horses (Ragnarsson et al., 2008). In Iceland, the DM digestibility of timothy haylage fed to geldings decreased from 72% (at stem elongation) to 46% (late seeding), which correspond to metabolizable energy values ranging from 14.1 to 9.0 MJ/kg DM. It was concluded that early-cut (stem elongation to flowering) timothy haylage was suitable for high-performing horses, while late-cut haylage (seeding to late seeding) was suitable for maintenance-fed horses (Ragnarsson et al., 2008). Timothy grass is suitable for horse pastures, but its high water-soluble carbohydrate content during the period of lush spring growth can predispose horses to metabolic disorders such as laminitis (Särkijärvi et al., 2010). In a palatability experiment in Finland, timothy pasture was ranked similar to tall fescue, higher than meadow fescue and lower than a mixture of tall fescue and Kentucky bluegrass (Poa pratensis) (Särkijärvi et al., 2010). Cassady, R. B. ; Sawin, P. B. ; Van Dam, J., 1966. Commercial rabbit raising. Agricultural Handbook N° 309, US Dept. Agriculture Ed. : 69 pp. McNitt, J. I. ; Lukefahr, S. D. ; Cheeke, P. R. ; Patton, N. M., 2013. Rabbit production. 9th edition, CABI Publishing, 296 p.
Schürch, A., 1949. The theoretical background of rabbit feeding. Schweiz. Landwirtsch. Monathefte 17, 22 p.